Synthetic peptide within Human EPF aa 50-150. The exact sequence is proprietary. Our Abpromise guarantee covers the use of ab108600 in the following tested applications. WB 1/10000 - 1/50000. 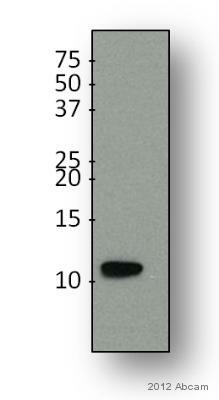 Detects a band of approximately 11 kDa (predicted molecular weight: 11 kDa). Immunohistochemical staining of EPF in paraffin embedded Human colon tissue, using ab108600 at a dilution of 1/250. Immunohistochemical staining of EPF in paraffin embedded Human kidney tissue, using ab108600 at a dilution of 1/250. Immunofluorescent staining of EPF in HeLa cells, using ab108600 at a dilution of 1/100. ab108600 showing positive staining in Normal uterus tissue. ab108600 showing positive staining in Ovarian carcinoma tissue. 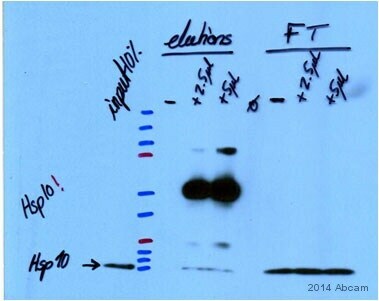 ab108600 showing positive staining in Normal breast tissue. 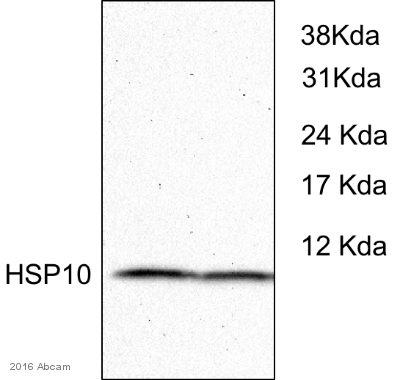 ab108600 showing positive staining in Colonic adenocarcinoma tissue. ab108600 showing positive staining in Normal stomach tissue. Publishing research using ab108600? Please let us know so that we can cite the reference in this datasheet.